Flying Colours has officially opened the doors of its new St. Louis, MO., facility. 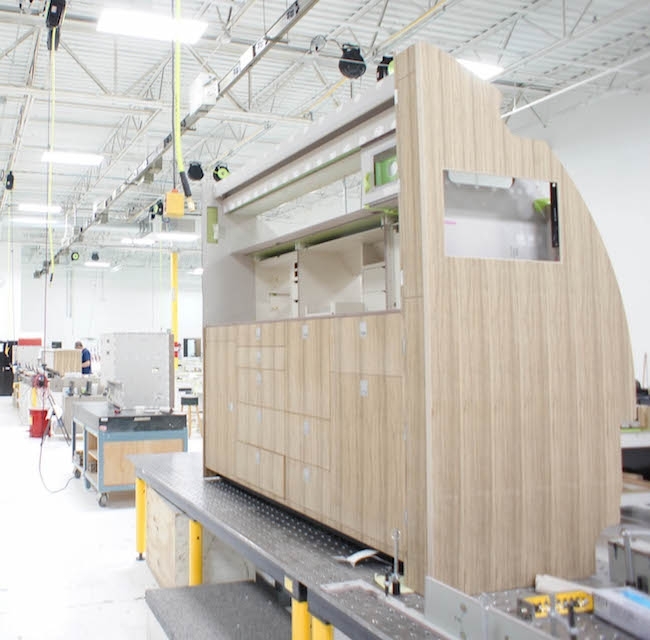 Manufacturing at the new facility, which primarily supports the design, build and finishing of woodwork monuments for large business jet cabins, has already begun. The first components will be delivered to an undisclosed customer before the end of March. The industrially designed floorplan was created with lean manufacturing operating principles at its core. This improves efficiency, and combined with the additional workshop space, is set to increase St. Louis productivity by 600% during the first year. The workshop capabilities mirror the Peterborough headquarters, but also incorporate new equipment for the St. Louis facility. To support working with composite materials a new “Edge Fill” machine fills the voids in composite panels after being cut and shaped by the CNC machine. The addition of two hi-tech paint booths ensures optimal surface appearance before final treatment in the new enclosed curing room. Flying Colours has also invested in a third booth dedicated to painting complex fasteners, and cabinet interiors. The layout ensures that the manufacturing follows the natural workflow with projects beginning on the CNC, before moving on to the expansive machine room which incorporates a selection of detailing tools for woodwork/cabinetry. Paint, finishing, framing and assembly follow, before the final quality control inspection. The space was initially specified to expand the monument capacity of the business however, Flying Colours has maximised the footprint to create spaces for upholstery, engineering, and avionics work, as well as production control offices, conference rooms, and bright contemporary client meeting areas. “Naturally alongside the cabinetry comes other work related to interior completions including detailed upholstery of seats, bespoke galley creation, manufacturing of customised monuments, and design of upgraded connectivity solutions,” explains Sean Gillespie, Executive VP, Flying Colours Corp. The St. Louis KSUS footprint is now close to 100 000 square feet and has required the addition of a further seventy team members, making a total of 180 Flying Colours employees based in the USA. “This is the first full infrastructure development to take place in St. Louis since we acquired the business in 2009. It was needed as demand for our cabinetry and completion skills was outstripping our capacity. This coincided with a rise in demand for OEM cabinetry work. The expansion reflects our overall strategic approach to business growth, and we’re not done yet as we anticipate a second phase of development in the USA later in the year,” adds Gillespie.